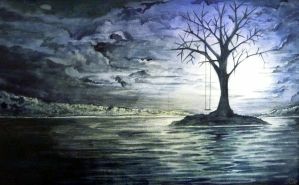 This painting is meant to depict depression. The raging sea represents anger; and the dark skies and use of only blue and black, sadness. The lighthouse is barely visible in the darkness and there is no beacon, symbolising the absence of hope and happiness. Wow. The waves seem to move in my mind. It looks awesome. Such a beautifully created piece of art for such a depressive theme. I like it a lot. reminds me of home at night. looks really great! Ah yes, takes me back. I also remember the first time I saw it, back in Yr 10. Good times, good times. What an artiste you are! i remember when i first saw this. i was with chloe and you and noura were in the art portable collecting your paintings. i didnt know you could do art until i saw that. i was so surprised! thanks! wow you remember the exact time you saw it! looking back over it now, i think i could've done a better job. but it may be that i have improved...i hope so anyway! i did that in yr 10. it seems like such a long time ago now! lol. yeh, we get that way all the time. i look at my older pics and i rekon theyre crap compared to now. lol. this was the first piece of artwork i'd ever seen u do and i loved it, still do! How time flies! i reemeber this!!! i love it!